dance-music laboratory (Montclair Academy of Dance and Laboratory of Music), which works under her artistic and pedagogic guidance. current events, personal experiences, myths, visual art (surrealism), and contemporary dramatic texts for productions and work with students. She follows Multiple Intelligences Theory of American cognitive psychologist Howard Gardner. Her Art is becoming political. She is inspired by Picasso, Bosch, Dali, Da Vinci, Magritte, Kandinsky, Van Gogh; texts written by: Beckett, Ionesco, Euripides, Brecht, Bond and Greek Mythology. VIRTUAL TRUTH (2013), Interactive (with audience) per formative moving drama. by perpetual contradiction of her inner voice. The audience is an observer a character. GUERNICA CONTINUUM (2012), Film, physical theater and drama. Discusses the depth of human evolution through sub consciousness, regression. An amputee and a girl with Cerebral Palsy are pushed forward. I HEAR WITH MY EYES (2011), Multimedia experiment. 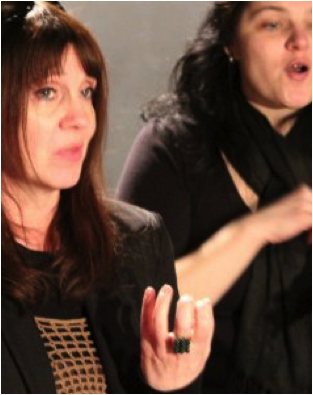 Hearing audience stands face to face with deaf people, and recognizes the difference. Pandora, Abstractions (Beckett, Bosh, Brecht), First Day 47, Lost Ones Opus 2 (Beckett), Adagio ma non Troppo (Original), Jokasta, Clytemnestra, Moon Above Mississippi (Seven Deadly Sins, Brecht), Night Bird, Tristan and Isolde, M&M (children), Cultural Capitol of Greece (Noah’s Arc), Fragments in Fabula, Come and Go, HP Madame’s portrait, Synthesis, Abstractions, and Noble Essences. Maya MW collaborated with European theatre director Tomas Pandur in Scherezade, Faust and Hamlet. Maya MW has collaborated with American jazz legend Reggie Workman since 1993. EVERY INDIVIDUAL HAS A TALENT! For children, youth, adults, professional performers, special needs, underprivileged, and the oppressed. Maya MW communicates a lasting change through gradual physical transformation, renewal in a way we think about ourselves, listen to ourselves, and connect with harmony, peace and tranquility. Maya MW uses the “power” derived from choreography “story telling” and movement, and adds rhythm, film and visual arts, as well as her own experiences to give art to people, and make them live through art. Her students practice creative and critical thinking and are encouraged to think “outside of the box”, while seeking new terrains. People experience how to understand each other, share energies, use inner voice, and build one’s own ability to create. An individual will uncover or come back to town place of power. Maribor (Slo), Groznjan (Cro), Ljubljana (Slo), Zagreb (Cro), London (UK), Italy and Germany. THE OPPRESSED AND MARGINALIZED, ESPECIALLY CHILDREN & YOUTH, PEOPLE WITH SPECIAL NEEDS, WOMEN AND GIRLS.